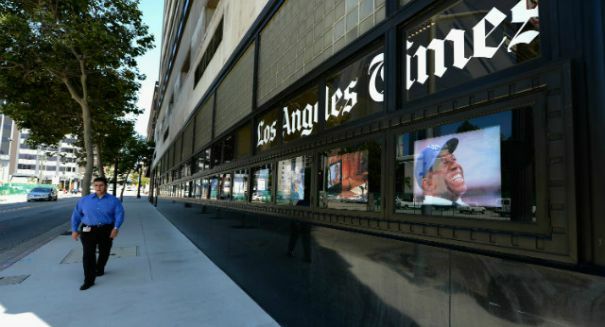 Is the Los Angeles Times in big trouble? Tribune Company is slashing revenue and earnings estimates -- 10 days after it fired the LA Times publisher. Everyone knows that the newspaper industry is struggling to survive in today’s digital media landscape — slashing staff, putting up invasive ads, going behind paywalls, and otherwise desperately trying to retain readers. But is the Los Angeles Times in a particularly large amount of trouble? Tribune Publishing, the owner of the LA Times as well as the Chicago Tribune, Baltimore Sun, and a plethora of other newspapers, has reduced its revenue and earnings expectations further this year, just 10 days after it canned the publisher of the Los Angeles Times, according to a Crain’s Chicago Business report. The company said in a statement that its earnings for the year would be about $145 to $160 million, before taxes and other expenses are taken out. That’s below estimates of $165 to $170 million estimated earlier this year. That also mean revenue estimates are down to between $1.645 billion and $1.675 billion after they had previously though it would be between $167 billion and $1.70 billion, the company statement reads. The unpleasant news comes not long after Tribune Publishing announced it would fire LA Times Publisher Austin Beutner on Sept. 8. Although they say he made progress at the paper and in the region, which includes the San Diego Union-Tribune after it had been acquired by Tribune earlier this year, Tribune Publishing CEO Jack Griffin wanted to go in a different direction that included cost reductions and an acquisition strategy that he hoped would keep revenue up even as advertising funds decline nationwide. The problem with the southern California region, the company said, was a delay in cutting costs. The firing Beurtner called for many in Los Angeles to demand local leadership at the newspaper, and some have even talked about making a bid for part of the company, including Los Angeles billionaire Eli Broad and Bruce Karsh, who is the co-chairman of Oaktree Capital Management, Tribune’s largest shareholder. If they were to pull the trigger on a buy, it would certainly a come a lot cheaper than it had been last year as its market value has plummeted, leading some to wonder how valuable an asset the Los Angeles Times is as well as other properties in the Tribune portfolio. The stock was as high as $25.50 in July and has plummeted all the way down to $10.59 today. The tumble in value will not mean good news for employees. As many as 80 Tribune Publish employees in Los Angeles were expected to be cut in order to save $10 million annually. Tribune Publishing Company is one of the largest American newspaper and print media publishing companies in the country. It is based in Chicago, home of its flagship newspaper, the Chicago Tribune. In addition to the LA Times and Baltimore Sun, its other newspapers includes the Orlando Sentinel, the Sun-Sentinel, the Hartford Courant, and the San Diego Union-Tribune, in addition to large number of local newspapers in a multitude of metropolitan regions. Tribune Publishing has a long and rich history in the United States, being founded all the way back in 1847 with the Chicago Tribune. The Tribune in recent times, however, has been struggling along with the rest of the newspaper industry to battle against the Internet and other forms of digital media as people began to rely on getting their news from elsewhere, and newspapers began finding themselves competing directly with each other in the global marketplace, when they wouldn’t have had to worry about anyone who was outside their region in the past. The company faced a huge debt load of $13 billion back in 2008 thanks to a big downturn in newspaper advertising revenue, forcing the company to file for Chapter 11 bankruptcy protection. At that time, it was the larges t bankruptcy in the America media industry’s history. The company exited bankruptcy on Dec. 31, 2012, when the company’s senior debt holders assumed control of Tribune’s property. Later, Tribune hired investment firms to oversee the sale of newspapers, and in July 2013 Tribune announced it would split into two companies, spinning off the newspapers into Tribune Publishing Company and leaving the digital media and other assets with the original Tribune Company. The Los Angeles Times has been around quite as long as the Chicago Tribune, but it is certainly not a young newspaper, being founded in 1881. In 2008, it became the largest metropolitan newspaper in circulation in the nation, and it was the fourth most widely distributed newspapers in the country. It was purchased in 2000 by the Tribune Company, which already owned local television station KTLA. The Los Angeles Times is certainly a well-decorated newspaper. Through 2014, it has won 41 Pulitzer Prizes. Among them were four in editorial cartooning, and they also won Pulitzers for reporting on the 1965 Watts riots and the 1992 Los Angeles riots. More recently, the paper won a Pulitzer Prize for Explanatory Reporting in 2009 on the growing problem of wildfires in the western United States.